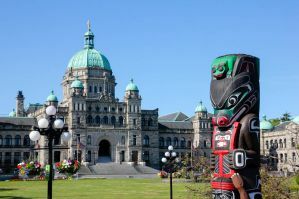 Victoria, capital of British Columbia, sits on the craggy southern end of Vancouver Island. With abundant parkland, it's known for outdoor activities. The city's British colonial past shows in its Victorian architecture, including stately Craigdarroch Castle mansion. Butchart Gardens, with 55 acres of vivid floral displays, plus statuary, water features and a carousel, is one of many formal gardens in the city. With a wider-metro population approaching 380,000, this picture-postcard provincial capital was long-touted as North America's most English city. Thankfully, the tired theme-park version of old-fashioned England is no more. Fueled by an increasingly younger demographic, a quiet revolution has seen lame tourist pubs, eateries and stores transformed into the kind of brightly painted bohemian shops, coffee bars, and innovative restaurants that would make any city proud. It's worth seeking out these enclaves on foot, but activity fans should also hop on their bikes: Victoria has more cycle routes than any other Canadian city. Once you've finished pedaling, there's BC's best museum, a park fringed by a windswept seafront and outdoor activities from kayaking to whale-watching. With all of these fabulous attributes, Victoria is a great place to visit, and, luckily, there are some great, budget-friendly accommodations to use as a base for exploring. 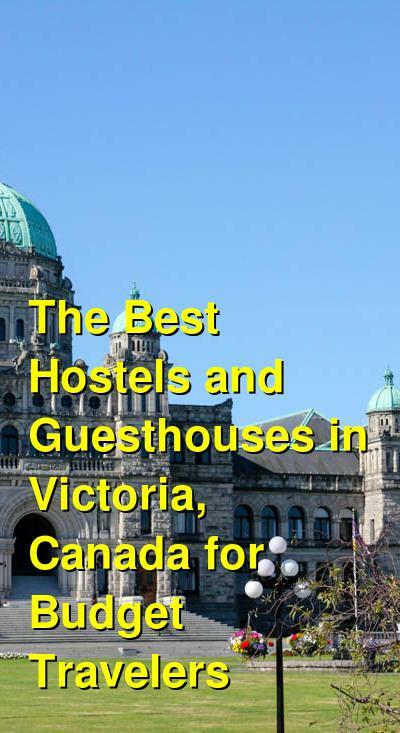 How much do hostels in Victoria cost? Ocean Island Inn is a bright and cheery four-floored accommodation with rooms of all shapes and sizes that is within walking distance of the city's highlights. Centrally located in downtown Victoria, Ocean Island has a wide array of rooms to suit your budget and lifestyle. You can choose from comfortable 4 or 6 bed dorms to private rooms. With easy access to public transit, ferries, and the airport, it's a great home base for exploring Victoria and the rest of Vancouver Island. If you're looking for privacy on a budget, they offer a mini room option with a very compact space but all the benefits of a private room - privacy, a comfortable bed, and your own mini fridge - at a fraction of the cost of a regular hotel room. If you like space, they also offer spacious, private rooms with ensuite bathrooms instead. The fully renovated 1891 heritage building is full of art and life and color. The facility has a large, vibrant communal dining area and kitchen as well as a cafe opened Monday through Saturday. The staff are warm and welcoming and willing to help with tour plans. Breakfast and Linens are included with your stay and towels are available for hire. The HI Victoria Hostel, housed in a heritage building in the city's historic downtown center, is close to the city's bars and nightlife and all the main attractions. Common areas have free wireless Internet. The property offers plenty of communal areas for meeting others and relaxing or having a good time and self-catering facilities are available if you want to prepare your own meal. There is no curfew and a 24 hour staff onsite, Cable TV, free movies. Discount tickets are available at front desk for local attractions, including, Royal British Columbia Museum, Craigdarroch Castle, Also discount for whale watching, kayaking and restaurants. The property is wheelchair friendly and linens are included in your stay. This laid back, Mountain view, Beach walk Guest House is a great headquarters to experience the nature of Vancouver Island. In the evening, you are welcome to use the kitchen to prepare your own meal if you wish. The property is located 40 km from Victoria and accessible by public bus and this location allows you to experience the untouched rain-forest and oceans. This affordable bed and breakfast guest house is designed to host budget travelers interested in exploring the wild west coast and meeting a few friends along the way as well as offering adventure tours. Sooke is the Adventure Center of South Vancouver Island, a one hour drive from Victoria also accessible by City of Victoria buses. Great beaches and provincial parks, beautiful untouched hiking areas, and breathtaking wildlife. The house is located right at the bus stop and within walking distance of the beach and stores/restaurants. They offer a complimentary healthy breakfast and adventure trips including the natural limestone waterslide called the potholes, mystic beach waterfall/rain forest hike, and nightly pier crabbing excursions.